Stainless steel blade geometry used in all aluminum patterns results in less blade flex. Higher efficiency equals better fuel economy, better top end, faster hole shot, and excellent cornering & handling. Vent holes in the prop’s barrel allow exhaust gases to escape, reducing water density around the propeller’s blades during acceleration. This causes the propeller to rotate faster at slower speeds resulting in more HP. More HP at lower speeds means faster acceleration and a faster hole shot. 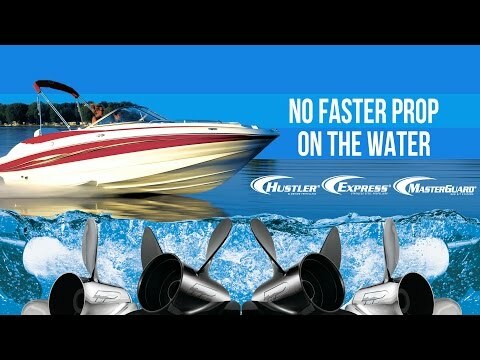 Turning Point is the only manufacturer offering this race proven feature in our Hustler & Legacy Aluminum Propellers. Available on most models, please refer to selection chart. produced by the prop, adding to boat lift and overall performance. Through advanced pitch line and rake line cupping. Maximizing exhaust flow increases horsepower and top end speed. Accelerating and channeling water to minimize slip increases performance and fuel economy. The 5 step process creates a uniform, durable, high-quality, and attractive finish that protects the aluminum from corrosion. Works with Mercury® Flow-Torq®, Michigan Wheel® XHS®, Solas® Rubex™ hub kit systems (All trademarks are the property of their respective owners). NOTE: Not applicable with Turning Point’s 10, 20 and 200 Hub Kit series. Utilizing high tech shock absorbing polymers and a solid brass spindle, the Turning Point MasterGuard & MasterTorque hubs will not corrode or break like competing hubs, and are covered by an industry leading Lifetime Warranty. Each hub’s one piece design ensures simple housing replacement, making a prop change quick and easy. Through advanced pitch line and rake line cupping.maximizes exhaust flow increasing horsepower and top end speed. Vent holes in the prop’s barrel allow exhaust gases to escape, reducing water density around the propeller’s blades during acceleration. This causes the propeller to rotate faster at slower speeds resulting in more HP. More HP at lower speeds means faster acceleration and a faster hole shot. Works with Mercury® Flow-Torq®, Michigan Wheel® XHS®, Solas® Rubex™ hub kit systems (All trademarks are the property of their respective owners). NOTE: Not applicable with Turning Point’s 10, 20 and 200 Hub Kit series.